The inside of Shrimp Kicks. Shrimp Kicks is a shoe shop in Booyah Base run by Crusty Sean, a shrimp. 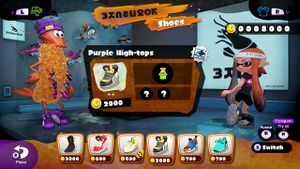 Shrimp Kicks sells shoes and boots that can be purchased with cash earned from multiplayer matches and amiibo challenges. Players can tilt to rotate their Inkling and click to try on the highlighted item, and pressing purchases the item. Pressing or allows players to enter Ammo Knights and pressing or similarly allows them to enter Jelly Fresh, while pressing takes players back to Inkopolis Plaza. displays further information about the selected item. A Red Hi-Horse in Shrimp Kicks. A White Kick and Cream Hi-Top in Shrimp Kicks. A Zombie Hi-Horse and Orange Arrow in Shrimp Kicks. Shipping containers with the Shrimp Kicks name and logo can be found in Port Mackerel. Ebisu shūzu Fishing god shoes (also a play on ebi, 'shrimp'). This page was last edited on 19 April 2019, at 12:12.